December is a tough month for college applicants. When you apply early decision to a college you love, it can be crushing if you’re rejected or deferred. If you’re rejected, you just have to pick yourself up and move on to the other wonderful colleges on your list. If you’re deferred, and you decide that you’re still interested, there’s a series of actions you can take to keep the attention on yourself for consideration during regular decision. Last year, Yale deferred 53 percent of early applicants – and only took a very small fraction of those later in the year. By contrast, Stanford prefers a simple Yes or No on most of their early action applicants. A deferred application is of course better than an No, but by no means a sure thing. One. Don’t focus too much at first on the deferred college. Work on the other applcations on your list, send them in before the deadlines, and then turn to the deferral. Consider whether this is still your top-choice. Don’t feel you have to follow through if you are no longer as enthusiastic. Two. Visit, if you can, and make the trip before March 1st. Particularly if you haven’t visited yet, and it’s within the realm of possibility, go. Colleges want to know that you’re really familiar with the place, not just from the website or its reputation. Sit in on classes, talk to a professor, meet with an admissions officer, have a meal or two with students, and talk to as many people as possible. If you do visit, you can mention your visit in the follow-up letter that you might write. But even if you’re not invited to write a letter, when you go on a tour, the college knows about it. Three. Read the directions from the admissions office. If the college wants additional information from you, they will say so – test scores, letters, grades. If the college tells you NOT to send any additional information, do what they say. Four. If you can send additional information, compose a one-page letter that reiterates the reasons you’re interested in that college, your plan to enroll if you are admitted, and any achievements since you sent in your early application. Address the email to the admissions representative who reviews applications for your high school with a copy to the Dean of Admissions. Though it’s tempting to express your feelings about being deferred – in a word, skip it. Five. If the school is open to more documents, you can get another recommendation from a teacher, a boss, an athletic coach, or a music teacher. Six. If you have taken additional tests, send those scores to the college by early March, and be sure to send your latest grades. Don’t overwhelm the college with information. Only send what they are willing to accept. And, as with all applications, predict the unpredictable – and remember that as long as you’ve applied to a good list of reaches, targets and safeties, you’ll be going to college. Send me an email if you want me to review your deferred application essays, and if you might want help with a letter to an institution that deferred you. 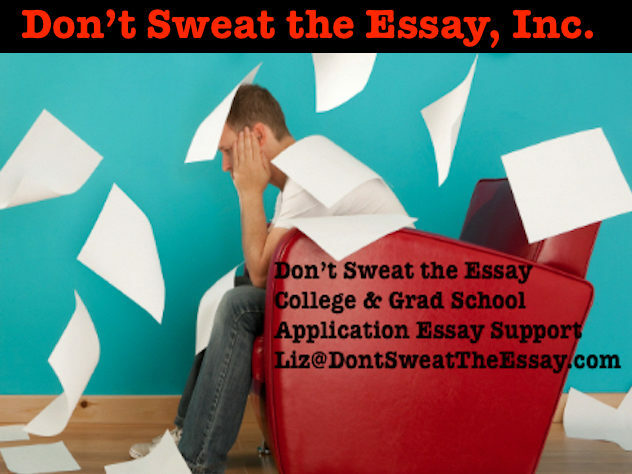 Liz@DontSweatTheEssay.com 1-855-99-ESSAY.